"I don't know that the photograph of Joseph was the best one I ever took, or my favorite, but I think it represented something important. At the time, it represented hope. Hope that what we were doing as a nation in Iraq was the right thing. Hope that our soldiers were helping people. 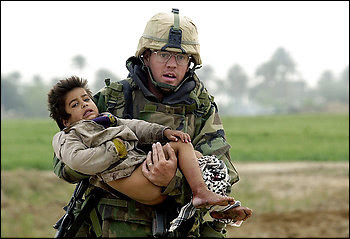 Hope that soldiers such as Joseph cared more about human life than anything else. "But now when I look at the picture, it doesn't feel hopeful. It makes me realize that so many soldiers are physically torn and in such mental anguish that for some of them, hope has turned to hopelessness." "Alliteration's affect on memory is not lessened by either the type of work it is used in or whether or not the literature is read silently or aloud." "We steal their hemisphere, kill twenty or so million of them, destroy five hundred separate cultures, herd the survivors onto the worst land we can find, and now we want to name them after ourselves? It’s appalling. Haven’t we done enough damage? Do we have to further degrade them by tagging them with the repulsive name of their conquerors? "And as far as these classroom liberals who insist on saying 'Native American' are concerned, here’s something they should be told: It’s not up to you to name people and tell them what they ought to be called. If you’d leave the classroom once in a while, you’d find that most Indians are insulted by the term Native American. The American Indian Movement will tell you that if you ask them. "The phrase 'Native American' was invented by the U.S. government Department of the Interior in 1970. It is an inventory term used to keep track of people. It includes Hawaiians, Eskimos, Samoans, Micronesians, Polynesians, and Aleuts. Anyone who uses the phrase Native American is assisting the U.S. government in its effort to obliterate people’s true identities. "Do you want to know what the Indians would like to be called? Their real names: Adirondack, Delaware, Massachuset, Narraganset, Potomac, Illinois, Miami, Alabama, Ottawa, Waco, Wichita, Mohave, Shasta, Yuma, Erie, Huron, Susquehanna, Natchez, Mobile, Yakima, Wallawalla, Muskogee, Spokan, Iowa, Missouri, Omaha, Kansa, Biloxi, Dakota, Hatteras, Klamath, Caddo, Tillamook, Washoe, Cayuga, Oneida, Onondaga, Seneca, Laguna, Santa Ana, Winnebago, Pecos, Cheyenne, Menominee, Yankton, Apalachee, Chinook, Catawba, Santa Clara, Taos, Arapaho, Blackfoot, Blackfeet, Chippewa, Cree, Mohawk, Tuscarora, Cherokee, Seminole, Choctaw, Chickasaw, Comanche, Shoshone, Two Kettle, Sans Arc, Chiricahua, Kiowa, Mescalero, Navajo, Nez Perce, Potawatomi, Shawnee, Pawnee, Chickahominy, Flathead, Santee, Assiniboin, Oglala, Miniconjou, Osage, Crow, Brule, Hunkpapa, Pima, Zuni, Hopi, Paiute, Creek, Kickapoo, Ojibwa, Shinnicock." "Russia has never once in a thousand years transferred power between rival political factions by means of an election. Russia is still singing the music of the anthem of the USSR, a totally failed state that caused the deaths of far more Russians than all the country's foreign enemies combined."